What Is a Constant Spring Rate? All cylindrical compression and extension springs have what is known as a constant spring rate. In the United States, more often than not this rate is expressed in terms of one value per another value and the word per is almost always characterized by the division slash that is denoted by “/ ”. In spring terms, the rate is expressed as the pounds of linear force needed to compress or extend the spring by one inch. Jargon to you, right? So, let’s talk in terms of something we are all very familiar with instead – your rate of pay. If you make $10 per hour – is that not your rate? Notice that it was expressed as “per” hour. And that could be expressed mathematically as “10/1”. I find that it is much easier to think of the spring rate in similar terms. For instance, if you make $10 per hour, it means for two hours of work you will be paid $20. But, what if you only work for half an hour? Do you still want to be paid? Of course you do. You want to make $10 per hour (which is your rate) times 0.5 hours and that comes to $5 dollars. Well the same is true for springs. As a spring maker, I’m frequently asked, "How can you express the rate of a spring as 10 pounds per inch if it is only half an inch long?" The answer to that is no different than you making $10 per hour and wanting to be paid if you only work for half an hour. If the spring rate is 10 pounds per inch and the spring is only half an inch long, maybe it can only be deflected a quarter of an inch. Well – going back to your rate of pay, if you make $10 per hour and only work for 15 minutes, don’t you want to make $2.50? I’m sure you do! When Does the Spring Rate Stop Being Constant? In the past, the spring rate was also referred to as the "spring constant" because no matter what, the rate always remained the same. So then what’s all this talk about the spring rate not always being constant? Let us go back to your “rate of pay”. What if you work 45 hours? Do you want to be paid 45 X $10 = $450? Or do you want to be paid (40 X $10) + (5 X $15) = $475? Of course you want to be paid extra for your overtime. So, your rate of pay is not really constant, is it? It is constant to a point and then it changes. Well the same is true of springs. 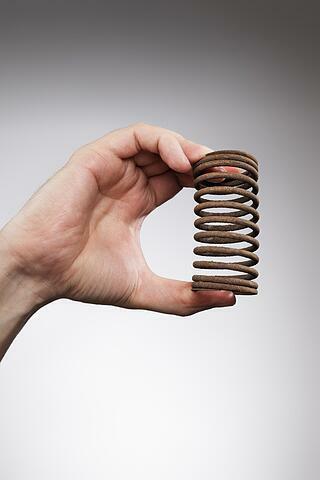 When some of the coils start to go solid and in effect are no longer active, the spring rate goes up. As illustrated in the image above, when a spring is deflected beyond a certain point, some of the coils begin to touch each other and then the spring rate rises just as your rate of pay rises after 40 hours. On the left we start with the spring having several open coils but by the time we get to the right you can see (on the bottom better than the top) that additional coils have closed and are no longer active, therefore reducing the number of active coils and increasing the rate. Typically the rate is said to be “constant” through 80% of the deflection and then the rate escalates as additional coils go solid and active coils are reduced. At Hardware Products, our aim is to make your spring ordering process as easy as possible. Contact one of our spring geeks today to help you find answers to your spring-related questions – be it understanding key concepts like spring rate or figuring out which spring steel works best for your next project.